Army Veteran Finds Blueprint for Success • Our Town America, Inc. 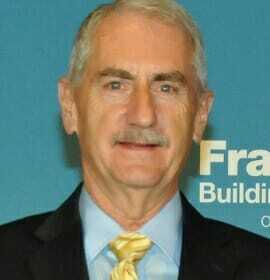 Franchising USA (October 2018) — As a three-year veteran of the U.S. Army who served during the Vietnam War, Larry Neal demonstrated discipline and commitment. As a corporate manager for 25 years, he learned and honed sales skills. As a self-employed home builder during the Great Recession, Neal experienced the value of persistence. All of those chapters of his life culminated in the decision by Neal and his wife, Paulette Neal, to purchase their first Our Town America franchise in Detroit in 2006. And by applying lessons from each of them, Neal has succeeded handsomely: The couple now own and operate three Our Town America franchises and have become regional developers, as well. Neal has found a particular fit for his military experience with the management philosophy and approach to business taken by Our Town America, which now counts three veteran-owned franchise units among 65 overall franchise locations. “In the U.S. Army, I learned about the value and effectiveness of sacrificing your individual desires in the service of large and important collective goals,” Neal explains. “I also saw how important it is for a group to have a proven road map to achieve its goals. In the early 1960s, Neal decided to leave his home town of Ironton, Ohio, to enlist in the Army. Neal’s Army service came just as the Vietnam War was escalating. After discharge, Neal went to work for a multinational chemical corporation and excelled in sales roles for two and a half decades. He had begun building homes as a part-time job, and after “retirement,” Neal slid into building homes on a full-time basis. But the brutal recession beginning in 2008 shook his world because the national housing bubble burst. So, Larry and Paulette decided to investigate the possibilities for owning a franchise. Our Town America proved to be a perfect match, and not only because Neal could apply leadership lessons he’d learned in the military. And Our Town America does more than its part to help veterans like Neal find that fit. For U.S. military veterans, the company offers a $10,000 discount on the franchise fee. For information about opening an Our Town America Franchise, please visit www.ourtownamerica.com/franchise-us or call 1-800-497-8360. After Hurricane Florence WBTV Reports on Our Town AmericaCause Marketing and Why Is It Important?